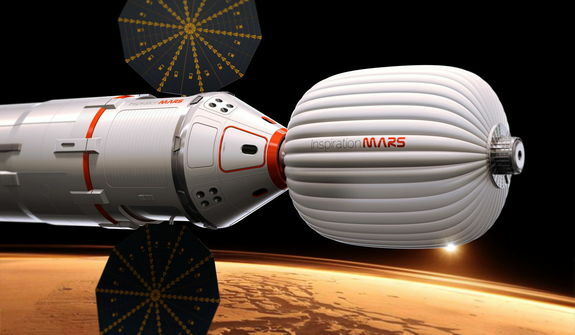 Renowned space tourist Dennis Tito announced plans at a press conference in DC to privately fund a manned flyby mission of Mars with a 5 January 2018 launch date. At the 27 Feb 2013 press conference he detailed the new non-profit he created to plan the mission called Inspiration Mars Foundation. This flyby mission of Mars would take two crewmembers on an approximately 500 day mission and bring them within 160km of the surface of Mars. Tito announced that the crew would ideally be a male-female couple, so as to combat the lonliness and isolation that is inevitable on such a long trip in cramped quarters. The Mars Initiative, a non-profit organization creating a public fund for the first human mission to Mars, posted their support for the mission on Facebook, saying "Inspiration Mars' planned human mission to Mars will inspire the whole world and be the start of humanity's greatest adventure. The crewmembers, whoever they may be, will be household names throughout the world, as children everywhere aspire to one day be like those "great explorers." The 2018 launch date was set to take advantage of a rare planetary alignment, which will allow the spacecraft to use Mars' own gravity to boomerang around it on its way back to Earth. The mission is expected to take 501 days to fly around Mars and come back to Earth, but the living conditions will be minimal, at best. The two crew members will have to live in a 17 cubic meter inflatable area, where they will be required to eat rehydrated food, drink recycled water, and breathe recycled air. Inspiration Mars Foundation Chief Technology officer, Taber MacCallum, says "We want to eliminate all the automation we possibly can," so the crew would even be required to maintain their own life-support systems. While the timeline to launch in 2018 will be cutting it close, Inspiration Mars is confident they will succeed because they will primarily be using existing technology and vehicles currently in the development stages. Among these are Falcon Rockets and Dragon Capsules currently in development by industry leader, SpaceX. The crew will likely be exposed to high levels of space radiation, but this is a risk that the volunteers will have to accept. Ensuring that the crew will be able to do their mission while aboard the aircraft is of the utmost importance. The Inspiration Mars Foundation's Chief Medical Officer, Jonathan Clark put it this way, "If you get back and you have cancer, we can deal with that on Earth... Our focus is minimizing the effects of acute radiation on crew performance." Regardless, the crew ould have to accept the risks before they are selected. As Jonathan Clark said, "Life is risky....Anything that's worth it is worth putting it all at stake for."